This is a multi-media 'show' with both articles and videos. the Mayan Calendar as relates to our current time-keeping system with the Gregorian Callender. 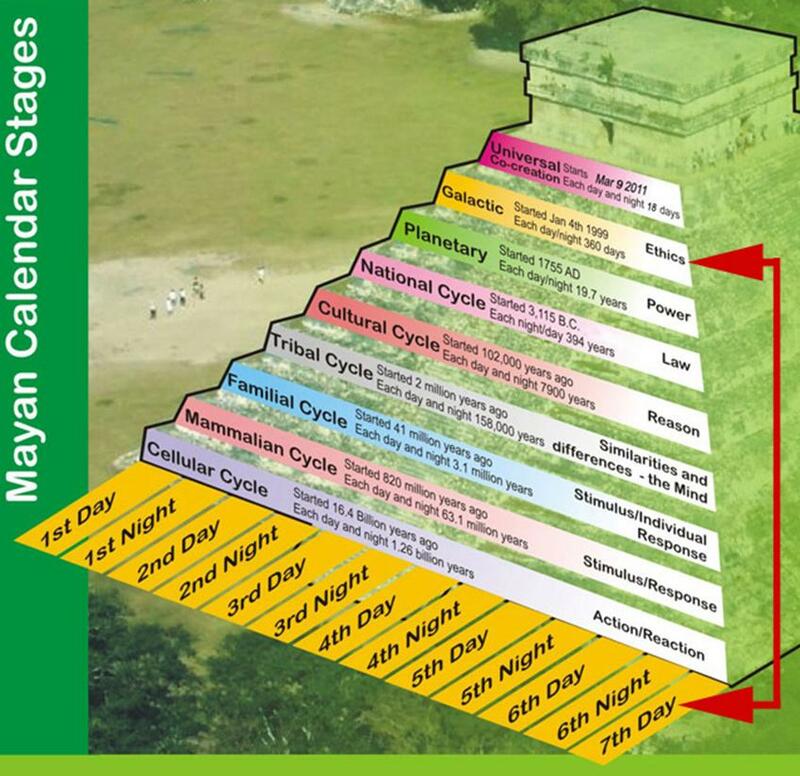 See Dr. Calleman's “Mayan End Date”. of completion of the Mayan Calendar is actually October 28, 2011. See: Galactic Alignment. which began in 1999 and ends next month… March 9, 2011. Family of Man in a Global Village. Ethics is now the core issue worldwide. Witness the ‘Tea Party’ movement here and the freedom movement in Egypt. minds of mankind merely wanting to live as kind men – a peace movement. and plan the 9th Wave in 2011 knows and serves - Universal Co-Creation. the atONEment for our sense of separation from the “United State of LOVE”. like the ‘Prodigal Son’ returning home in 2011”. from his recent article that is going viral on the Internet. “For those who think 2010 was a significant year of change, hang on! and think we were standing still. “Many will rightly ask, ‘On what do you base this prediction?’ "
According to the best interpretation of Mayan Calendar information, the entire ninth step in the evolution of consciousness will take place in 260 days: basically, from March through October 2011. Unlike most Mayan calendar teachers, Dr. Carl Calleman does not buy into the December 21, 2012 theories. He studied the information as a scientist, and came to a different conclusion, with October 28, 2011 being the completion date. Many other teachers who have looked at his information are in agreement. I am one of those, purely on the basis of resonance. There have always been unseen energies that impinge upon our visible reality. Many world religions have referred to these energies as angels. Those who look at the evidence, going way back in human history, come to the conclusion that there are many ancient records of Earth being visited by beings from the sky. Many cultures referred to these visitors as gods. Open-minded scientists and researchers in today's world recognize an exponential increase in the activity of beings from other dimensions that are involved in events happening now on planet Earth. Yes, there has been a strong desire to keep this information from the public on behalf of the powers that be – the proverbial Man behind the curtain. However, many nations have already released their UFO files to the public. The United States still has not followed suit, with its leaders grasping with great determination to prevent widespread disclosure from occurring. What are they afraid of? The truth is, our history, as we have been told it, is a lie. From the very foundations of world religions to the structures of modern governments, the truth has not been told. Irrefutable evidence and revelation of facts will transform everything. Perhaps that will be the big change in 2011. Disclosure, not only of the fact that we are not alone in the universe, but more importantly the reality of the deep involvement of ETs throughout our history, will shift the paradigm of reality virtually overnight. Faced with undeniable proof, mankind will have little choice but to see the world with new eyes. It will be the overwhelming display, often referred to as first contact, of ET presence that will create unity very quickly. Not everyone is ready to buy into this; nevertheless, the critical mass has already been exceeded. What is the critical mass? Scientists tell us it is the square root of 1% of the world's population. Rounded off to the nearest thousand, that would be a little over 8000 people*. That's all it takes to shift the entire human race. From a biblical perspective, perhaps it's the 144,000, that enigmatic number that brings the Kingdom of Heaven to earth. In truth, I think even that number has been exceeded. Whatever the number, we have crossed the threshold of the point of no return. The Word has been made flesh, and the manifestation of the Golden Age is here now, unfolding day by day. As a seer, I can sense the struggle taking place right now in the human population. I know how hard it is for people of many faiths to even consider the possibility that some of their precious doctrines may be in error. Nevertheless, incongruent beliefs will, of necessity, fall apart. So much that has been built into our belief systems has been included for a specific purpose: to disempower the average person and keep them subservient to the control of those who would be masters over them. Note from CR: this ‘disempowerment’ is a disconnect from -- and depression of -- the Spirit that matters, i.e., duality’s divisive dysfunction versus unity’s atONEment function. We're either busy being born in the image and likeness of 'the light side' (lightbearers), or we're busy dying to the 'dark side', the ‘shadow part’ of our collective Conscious Self which mirrors not only the paradigm shift to -centric civility, but also that great light's 'shadow' on the screen of Collective Conscience. The 'shadow' is our collective unconscious habits of an unloving nature; The paradigm paralysis of division and dysfunction is naturally disintegrating as the paradigm shifts to Unity Conscience, integrating the unconscious, subconscious and supraconscious dimensions of consciousness via enlightened full spectrum Conscience of a whole, holistic, holographic or otherwise holy nature. The big lie has been easy to sell, since it coincides so well with our physical observation. That lie is separation. I look at my body; then I look at yours. Obviously, we are not one. I am me; and you are you. And every other person is also separate from me and you. However, this paradigm presupposes that only that which is visible is real. Modern mystics, called quantum physicists, have demonstrated scientifically that the world we see is only a small fraction of the world that exists. In other words, reality is mostly invisible to us. That which we have been unable – and in many cases unwilling – to see is going to be made abundantly clear to everyone as the invisible becomes more obvious. Can you see, or at least begin to see, how quickly this revelation will be able to shift everything? It will be as if higher compartments of our minds are suddenly opened, revealing our blind spots. Most of us will ask ourselves: "Why couldn't I see this before? It's so obvious!" ... Everything in its time! The hidden treasure within each of us will soon be revealed to all except the most hardhearted and stubborn minded individuals. That treasure is what the world religions have always pointed to. It is the Christ, or the Divine within each of us. Can you begin to imagine what we will be able to create together, knowing that the God Spirit is in everyone; and it has never had anything to do with one's religion? Whether you can imagine it yet or not, this is what will happen, or at least begin to happen on a large scale in 2011. This is why 2011 will make 2010 look as if it wasn't going anywhere; yet, in truth, each step in the evolution of consciousness builds for the next step. Everything that ever has been, has been building to a grand climax of ecstatic revelation: the revelation of Christ as ALL and in all. Note from CR: This is the true meaning of the ‘2nd Coming’… the mass “awakening” (Coming) of Christ-like spiritual virtue in our collective hearts and minds. This is the way out of the ‘healing crisis’ whereby love heals all. It’s the end of war whereby Love conquers all, winning hearts and minds, and culturing mass-to-mass TeLeComm to re-establish the infrastructure for the ‘Next Economy’ based on the currency of Conscience… the foundation for Unity Conscience, worldwide , etc. The promises of God are: Yes… and Amen (so be it). The Creator has always had a purpose for Creation. That purpose has not always been easy to determine, and even more difficult to see. As the plan has unfolded, most of us have only been able to see the chaos. Conflict has seemed to rule the day; and making sense of the whole thing has been well-nigh impossible. Yet, those who have been able to see from the other side have always told us that there was meaning. These were able to see, if only in flashing glimpses, that a grand plan was underway. Note from CR: The web of consciousness with the “www” (world wide web) today has matured to the point of a natural mandate for the 'grand plan' - our divine destiny of, by and for self-correcting sovereignty principles at the heart of Net reality, a heartware upgrade of, by and for the all-connected web of Unity Conscience at the heart of the ‘web of life’. Witness how the mysteries of time and space are being unveiled – quantum reality -- with an emerging “common sense” (Unity Conscience) which honors our new instant-everywhere and interactive response ability -- the ability to respond by linking the light of -centric Conscience; weaving the fabric of the web of life with pure intention that focuses attention on our evolutionary ascension as a holy whole… a holographic unified field of enlightened full-spectrum CONSCIENCE in the “global brain” (5-D Conscience), i.e., a ‘prayer field’ of expectation and anticipation for the ‘KINGdom CONSCIENCE’ whereby all are sovereign “KING” (Keys to the INternalization of God; Geometrically Ordered Divinity). framework for the cosmic constitution of . the SPHERICAL CONSCIENCE at the heart of . as a balanced whole which is greater than the + parts. as the role and goal for UNITY CONSCIENCE of a holy whole. We've called them prophets or shamans; and each of them with an honest heart always told what they felt, saw or heard. They have spoken in every culture and in every age. They were the Voice of God, inspired to speak to their generation. I'm not about to tell you that any of them were perfect – far from it. They were men and women, just like you and me, who had to deal with all of the perplexities of their individual lives and still make sense of their dreams and visions that often contradicted what they saw in the physical world. These are those that have held the dream alive within the human family. As the Spirit of the Living God brings these gifted men and women together, a new world will be born. These are the co-creators responsible for the time in which we live; for we are the ones that have searched for a city that has foundations, whose builder and maker is God. We are the ones who have often been despised and rejected of men. Yet, in a very real sense, we are only eyes in the body. We are important, yes, we are. However, we cannot do it alone. Everyone must find his and her part in this Body of Humanity that is being transformed, day by day, in ways that will manifest more clearly in 2011. We are talking about a new humanity here. That which was impossible before will be soon possible again. We're about to see the Son of God with new eyes; and as I look at this beautiful creature made without hands, my eyes fill with tears. The whole cosmos marvels at the magnificence of the Word Made Flesh, multiplied to infinity – a multitude that no man can number (or at least count). To me, this is the real meaning of the second coming of Christ. And all the world shall see Him, and be like Him. Let each with eyes to see and a heart to love rejoice. The Kingdom of Heaven is at hand. 2011 is our year. "Behold, I make all things new!" says the Lord Most High. Namaste. * The square root of 1% of 7 billion people is 8,367. The estimated population, however, is 6.67 billion; and the square root of 1% is 8,167.
and what this means for our DNA, consciousness and world-at-large. The business of evolution is not a mystery when known. the heart of our social networks and next economy. Many people may not associate the word power with the word peace. Perhaps it is because power is often associated with force, which is often anything but peaceful. Those who have read Dr. David Hawkins book: Power vs. Force may realize that true power is an innate spiritual quality, whereas force is often seen as a military-like feature. To me, world peace can never occur on earth until its people step up and exercise our inherent, natural power ... together; however, I feel that we will actually do that this year ... in 2011. When we do, we will co-create a new world together. 2012 will be vastly more peaceful than what we have always known—all because of what is called: THE AWAKENING. unless he also opens the depths of hell. the embrace of Christ or the challenge of Death and Hell."